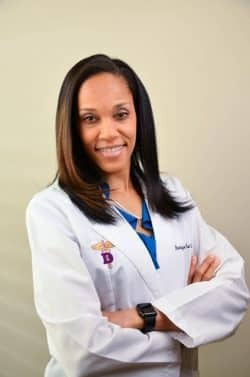 Dr. Keane-Dawes was born in Spanish Town, St. Catherine, Jamaica. One of two children, she was born into a loving family where her mother was an educator and her father a priest. She showed a talent early on for track and field, where she competed throughout high school and college. She earned a scholarship to Eastern Michigan University, where she competed for four years at the Collegiate level. After college she decided to pursue a career in dentistry. She attended the University of Detroit Mercy School of Dentistry, graduating with a Doctor of Dental Surgery degree in 2007. She went on to further her training in the Advanced Education in General Dentistry at UNC School of Dentistry in Chapel Hill, NC. In her spare time she enjoys outdoor activities, indoor rock climbing, going to the gym, traveling to different countries, listening to different genres of music, and working hard to maintain a healthy lifestyle. She is an active volunteer with her church and a non-profit dental clinic.